I had a great mail day!! Goodies in the mail, originally uploaded by Temeculamom. Yay! Thank you, thank you! to my friend at Huntforvintage who sent me these goodies in the mail. 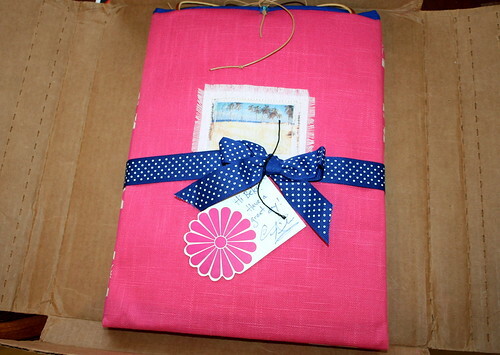 Look how pretty her wrapping is! The pink fabric you see is a cute bag. Inside were a darling vintage velvet hairclip, a beaded vintage clutch, a lovely tinted photo of a woman in the original cardboard frame, and a framed ad? of women’s headwear over the years (this may go in my bathroom). How cool is that? She had a blog giveaway, and everyone who commented won something! As if that weren’t enough, I also got this Max Factor makeup in the mail. I am a Bzz Agent (google it), and I get to try out great new products for free. The lipfinity isn’t a great shade on me, but it lasted all night and the next morning without ever giving me dry lips. Pretty cool mail day, huh? ~ by bekaboo on August 19, 2008.